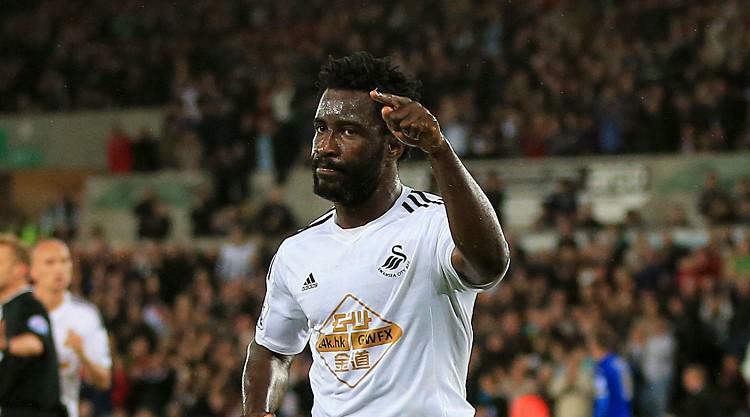 Swansea striker Wilfried Bony has been ruled out of Saturday's home clash with Crystal Palace and the trip to Liverpool on Boxing Day by a hamstring strain. Bony was forced to come off in the opening few minutes of Monday's 3-1 loss at Everton. And caretaker boss Leon Britton said on Thursday: "He's got a hamstring strain that he picked up at Everton and it will be about seven to 10 days, so we will see how we go with that." After the Liverpool match Swansea are at Watford on December 30, and when asked about the prospect of Bony being involved there, Britton said: "Maybe he has an outside chance, but that might be pushing it." The loss at Everton was Premier League basement boys Swansea's final match under Paul Clement, whom they sacked on Wednesday. The Swans announced on Thursday morning that long-serving midfielder Britton, who last month became a player-coach at the club, would be in caretaker charge for Saturday's contest. Britton gave the update on Bony at a subsequent press conference. And when it was put to the 35-year-old that he could now pick himself, Britton said with a smile: "I can, but unfortunately I have a bit of a calf strain at the moment, so I'm out for Saturday."